There’s Still Time to Enter Essity’s Jammin’ Jingle Contest for Middle Schoolers—Deadline Extended to February 25! Jingles are memorable, aren’t they? It’s easy to get a TV commercial with a creative jingle “stuck on repeat” in your head. Or maybe you find yourself singing a catchy tune, over and over for hours. We need your help to write a memorable jingle that will inspire children to wash their hands for 20 seconds. Are you up for the challenge? We need your help to create a memorable, jammin’ jingle for the Handwashing Works! hand hygiene education program! Write a 20-second jingle about handwashing, specifically about the importance of scrubbing your hands. 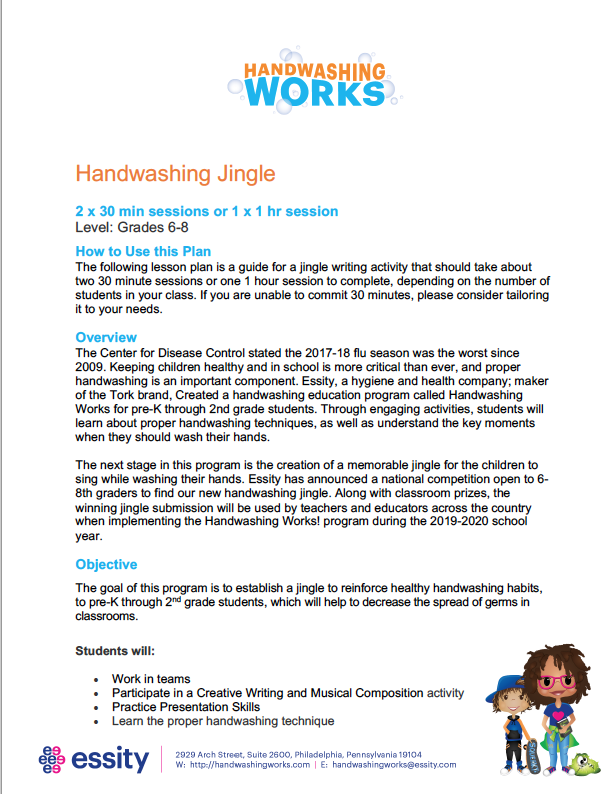 The winning jingle submission will be used by teachers and educators across the country when implementing the Handwashing Works! program in 2019-2020. An easy guide on how to easily incorporate this into your lesson planning! Hand out this sheet to your students to help aid them in the jingle writing process! 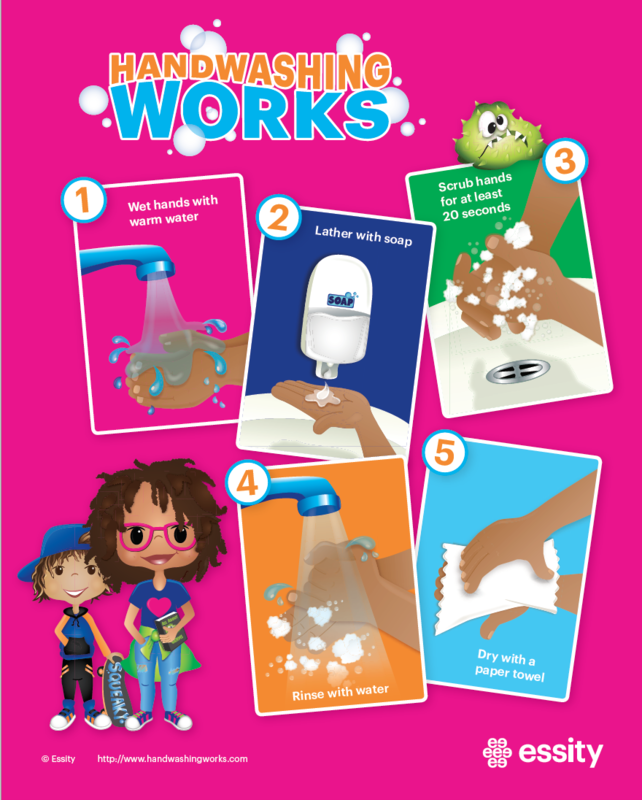 Our comprehensive guide to the correct handwashing steps. A great resource! One Grand Prize Winner will be awarded: Winner will receive a $1,500 Grant for your school and a Pizza Party for your classroom. School Prize: The school of the Grand Prize Winner will win a variety of Tork® brand paper products. The contest deadline has been extended—all entries must be received by midnight on February 25, 2019. Winners will be announced the week of March 18, 2019. Download the guidelines for more information on the contest and important submission details. Access the guidelines here. Submit your jingle in two formats – Provide the written text of the jingle with a description of how it could be taught to Pre-K through second grade students. Submit a video: sing the jingle and show us! Upload your materials here. 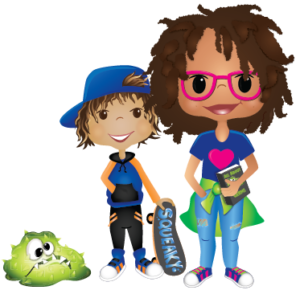 Sign up for contest updates and reminders, handwashing facts, Gunky Gus blog posts and creative inspiration!